In the latest episode of the “I Am A Mainframer” podcast, Steven chats with Alex Kim from Vicom. Alex tells Steven about his journey to the mainframe, how The Open Mainframe Project’s Zowe framework is contributing to Vicom’s innovative VIVA project, and where he thinks the mainframe is heading in the next few years. Steven Dickens: Hello, my name is Steven Dickens and you’re here for the I Am A Mainframer podcast, brought to you by the Linux Foundation’s collaborative project The Open Mainframe Project. I’m really glad today to have one of my good friends out there in the community. 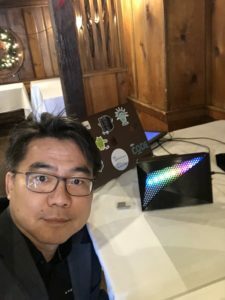 Joining us is Alex Kim who’s really a rock star out there in the community really on the cutting edge doing some cool things. So Alex, welcome to the podcast. Steven: The honor’s all mine. It’s really good that we finally get you on to the podcast. It’s been too long. So Alex, just get us orientated. Tell us a little bit about yourself. Give us an introduction. Let the listeners connect to who you are and really give us a perspective and get us started here, if you don’t mind. Alex: Hello everybody, my name is Alex Kim. I am a mainframe engineer and an architect. I started working as a chip designer in mainframe in IBM Poughkeepsie in 2001. I was in a team where we developed crypto express cards and I was a designer for the AES at the time. It was a new encryption algorithm standard. I moved to different development projects and then also moved to a sales organization as a pre-sale technical specialist covering the financial sector in Wall Street. I’ve been with IBM premier vision partner Viacom Infinity for about five years now working with various clients. There are nice teams in here and we’re still at IBM and working with IBM teams like Steve and working on a lot of fun projects. Steven: You’ve been too humble there my friend. There’s some really good stuff that I know you’re doing and we’ll come back to that later on in the podcast. But that’s a very humble overview of your skills. I see you as one of the guys on the cutting edge there in the community, working on some interesting stuff. So, I think it’s gonna be good. If I can get you to be a little bit less humble and tell us a little bit more about what you’re doing out there and some of the cool projects. One for me would be the crypto stuff. That’s the cutting edge and are typically the best and the brightest. So, maybe just give us a little bit about how you got started. Where you were working first on that some of that crypto technology. I know that’s getting a lot of press right now. And depending some of the cool stuff like Blockchain on the platform. So really keen to if I can get you to give a little bit of your perspective and how you got started on the platform. Alex: Sure. So I was a graduate student at Polytech University in Brooklyn, which is now part of NYU. My advisor and professor in my research plan, I was part of the chip design lab. It was around 1999 and 2000. I think at the time the encryption standard was Triple DES, which is known as the Data Encryption Standard was fading out because computing power was at a point where you can break the code or in a day or so. So, there was a proposal out there from many different countries and candidates submitted. At the end, there was an aggregation selected called AES. That was the product that I worked on. One day I was walking by the library and there was IBM recruitment on campus, and they are giving a pizza away. So, I went there for pizza and I started talking to our recruiting manager. She was very interested in my research and asked me to bring the regimen the next day. So, I did and after like five months after I started working for IBM. So, I got really, really lucky. Steven: So we have a free pizza to thank for us starting your career on the platform. It’s amazing what you can get with free pizza. Alex: Oh, yeah, yeah. College kids and pizza. You can never separate them. Steven: That’s one for me to remember. Next time I’m doing a hackathon with The Open Mainframe Project. So starting off in the crypto space on a really cool project got you into the platform. Then you no longer work for IBM, you work for Vicom. Tell me a little bit about that transition and how you made the move from IBM to one of our great community members who work on the platform and really support your fun side. Alex: So, when I moved to the Wall Street clients set to support my sales team for IBM, one of my clients I was working with was supported by an IBM partner. I learned about the company, and how they assist on top of IBM Support and collaborate with it. I think IBM wanted to encourage a lot of partners to take more ownership. I saw the opportunity that I can contribute in that effort, and support my clients with some other skills that I had from the development experience. I was doing other things that maybe help customers to use mainframe more. So, I wanted to join the team and thankfully I was able to join. I still work with the same team from IBM, but I think I’m proud of extended team. Steven: Fantastic. The podcast is called I Am A Mainframer. You know, I think a lot of our listeners are either established on the platform or a new and trying to understand it. I’ve been really keen to get your perspective about why you see yourself as a mainframer. What got you interested? So if you could maybe give us a perspective there that would be really interesting for the listeners, I think. Alex: When I started working for IBM in 2001, the first year I learned a lot about things. The acronym was “RAS”, reliability, availability and serviceability. It’s almost engraved in my brain that anything I do, I always think about that. So, when I think about the mainframe it’s those three letters: reliability and availability and so serviceability. I was working with at the time a distinguished engineer on a RAS feature. So he’s basically with other team members the RAS theory and developed a lot of chips and mainframe architecture with that. So going to his office, looking at all this research documents that he created from the basic components into certain level to the architecture level was amazing. I think mainframe today still stands for those three letters and then it became an enterprise system or enterprise computing when I came to the field. Customers actually rely on those three things. Critical business should have those three things all the time. Steven: I agree when you speak to clients and when we speak to people on this podcast those really sort of come through. As key foundations for how they use the workloads on top of the platform, and really some of the architectural choices, the development teams, making the hardware engineering teams and ultimate those clients are when they’re architected for these workloads. I think it’d be really good to maybe share that with some of the listeners. One of the coolest things I’ve seen over the last sort of 12 months is somebody developing a voice assistant for the mainframe. I know that’s your pet project. It literally blows me away every time you demo this. So, can you just share with the listeners what you’ve developed what Viva as a project is and really what we can expect from that technology coming out over the next few months. Alex: Sure. VIVA stands for Vicom Infinity Voice Assistant. A lot of people, including myself, has a voice assistants at home. I have like six or seven Alexa ECHOs at my place. A lot of people might have Google Home and I use it daily. And I think it will be another major human interface to the computers. The beginning of this fever project for the mainframe was starting with thinking “how cool it would be to ask a question to a device how the mainframe is doing?” Every morning I have two kids going to school, and I to clothe them properly I ask, “Alexa, how’s the weather?” Then she answers me, then I can get the information right away so I don’t have to look at my smartphone for the temperature for the weather. So, I thought it’d be cool to do that with the mainframe. I started with our summer intern in 2017. This was second year he’s come for a summer internship at Vicom Infinity. His first year, he got a project for Hyperledger which is very high level and very conceptual. So the second year he wanted to do something fun and realistic and I picked three things together. Raspberry Pi, voice recognition and RESTful API for the mainframe. So, we meshed that together and came out with something that you can ask questions about the mainframe systems. So we showed our demo to our president at the time at the end of the internship testimonial. Our president really liked it and I think he saw the potential that it could be helpful to our clients at some point. So we started investing more time and effort and came up with a more secure and more reliable usable technology so that you know we can introduce it to our clients. Steven: Fantastic. Anybody should look out for the demo of this. I think it’s a really good user interface. Not only a fun project, but I can see the business applications. And the way you demo it getting those executives to query about the mainframe performance, peak usage, your month end process in or after a busy day being able to just query the mainframe and check performance. I think it’s a really cool project. One of the other things that I know you’re heavily involved in is Zowe. I see your name more frequently than I see anybody else is probably in the Zowe slack channels. Can you just give me your perspective of Zowe and maybe if there are any connections to VIVA, of how you see that? Alex: I’m more of a user of Zowe the open source project. We really think it was a perfect moment for Viva because we ere using API connected to time to integrate many other system API’s the mainframe, but we wanted to use something free so that you don’t have to pay to start the project. When we were introduced to Zowe, I was like, “Wow, this is it. We should definitely dive in and use it”. We got it working after two months. We got a lot of help from local development teams and from overseas in the U.S. and Canada. It was great working together and they still are working together. It was a perfect match. Steven: So where do you see Zowe going? Have you see its impact on the rest of the open source community and on the mainframe community? Alex: I think its more of a testing the water period, that a lot of people want to get some awareness, and how it’s being used with the initial packages. For example, our use cases demonstrate how you can create an API and then integrate it with some other application in your enterprise. I think as for Zowe, if people continued to demonstrate their use cases, a lot of people will have their own ideas and their own way to contribute back to the community. Steven: So it’s interesting to talk about community. We’re on the Open Mainframe Project podcast. What role do you see the OMP and the Linux Foundation playing in that mainframe community? How do you see that coming together? Alex: I think the OMP has done a great job for the past three years. It’s been great, especially for Zowe’s side was the US Open Source projects. I think there are some mainstream audiences that may want to know about this. Also, working together in the open source community will have great potential to expand mainframe users and developers. For example, having some other Linux Foundation project like Hyperledger or Let’s Encrypt, and have them integrate something with Zowe across platform development might be something good. I would love to see that happen as a personal user. And I think there will be a lot of development and collaboration on the non-mainframe side. Steven: Where do you see the mainframe platform going over the next 12 to 36 months? Where do you see for the short term and maybe medium term future? What do you see ahead for the platform? Alex: I think that the pervasive encryption topic that IBM is easy to broaden to the market really hit the hat. It couldn’t be better timing or, I shouldn’t say better because we see a lot of security breaches and I think he should, we talk about the encryption and security vulnerability, and how to how to exploit the features and how to prevent data breaches. Open Source traditionally address those areas very well. I think having OMP with the Linux Foundation focusing on the security topic over the next 36 months might be very good. I think has potential as that people will try to drive it that way. Steven: Yeah, I think it’s going to be an exciting time. I mean with what’s coming down the pipeline from some of the security guys here. You know, it’s the communities definitely digging in on this requirement. Every day you hear about a hack at there and some other companies being hacked. So, I think as we all look to engage with clients around the mainframe platform and security, that message just seems to resonate. Alex: I see a lot of our customers finally getting to the ideas and started to implement those pervasive encryption features. There’s a lot of open source out there and you can run it on any platform. So we just need to let people know that they can choose to run open source on the mainframe and then make it stronger and protect it. Steven: Yeah. That’s a foundation for me, the ability to protect that data and be able to provide a platform where you know you’ve got encrypted data. You’ve got that strong robust security at every level through the stack. That’s just foundational for me whenever we talk to clients so I’m not surprised. You say that but it but it’s reassuring to hear that. That’s coming through in your conversations out there in the community. Alex, This has been absolutely fantastic. Always a pleasure to talk to you. You’re such an innovator in the space. We talked about Viva and I recommend everybody check that out. Is there anything else you want to share with the group as we would look to wrap up? Are there any other sort of parting final comments? Alex: I really wanted to thank you, the Linux Foundation, The Open Mainframe, and the other developers of Zowe and development community for their endless time and effort putting this together. Steven: Oh it’s always a pleasure Alex. Always great to talk. So you’ve been listening to the open mainframe project. 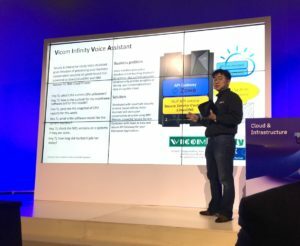 I’ve been talking to Alex Kim from Vicom about some of the great work he’s doing and how he’s innovating on the bleeding edge of voice recognition and the mainframe. Please look to subscribe and join us again for future episodes. My name is Steven Dickens. 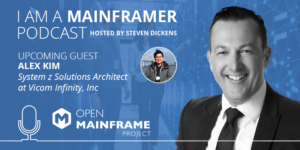 It’s been a pleasure talking to you today on The Open Mainframe Project, I Am A Mainframer podcast. Thanks for much for your time.